It’s natural to feel your own competitive streak flare up when a colleague is constantly bragging about the praise they received from the boss, the number of sales they made that day, or how much clients love them. However, fight the urge to be equally competitive. Doing so won’t make your working situation any more pleasant; in fact, it will only cause tensions to flare even more. Just because your colleague chooses to bring an unnecessary level of competition to the workplace, doesn’t mean you need to do the same. When you have a highly competitive colleague, it’s easy to let them consume your thoughts. However, instead of worrying about what they’re doing and saying, make it a point to focus fully on your own role within the company. Be a team player. Share ideas, help out co-workers when they’re in a jam, and don’t be the first to take credit when something goes right. When others see you as an essential part of the office, your stock within that company will rise, regardless of others’ behavior. 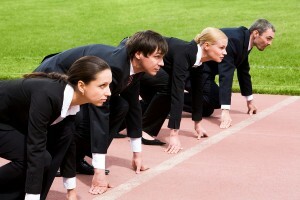 Even the best offices can be plagued with one or two overly competitive people. However, it’s necessary to take a step back and analyze the situation. Do you find that many or most of your co-workers are unnecessarily competitive? If so, you may want to consider finding work elsewhere. This kind of environment can quickly become toxic and detrimental to your career and mental state. If your co-worker’s behavior is impacting your own ability to perform, it’s time to say something. You don’t need to have a screaming argument in the middle of the cafeteria, but you should be honest with them and explain how their actions are affecting you. In some cases, the individual may have no idea that their competitive nature has become out of control. Cluing them in can help them to tone down these tendencies, making the company a much more pleasant place to work. How do you deal with overly competitive co-workers? Let us know in the comments!